You can search for published layouts here. Simply enter the title or the GUID of the layout you are looking for. To the right of the search field, you can sort the list by title, date or user. Switch between ascending and descending order. Click here to see the layouts that have already been published in the portal on the right. 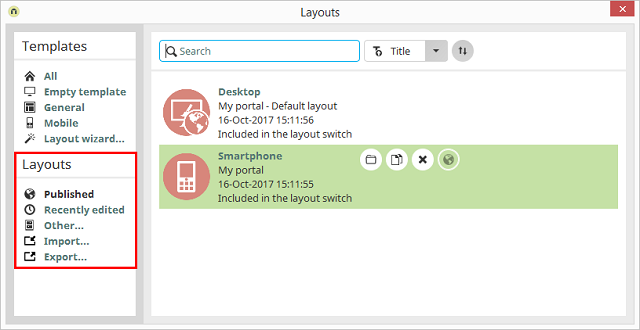 In a brand new portal, you will find the default layout that is used to open the portal in the browser. All layouts will be listed that have been edited recently. Opens a dialog where a locally saved layout can be selected and opened. The layout is defined as the default layout. Duplicates the current layout and opens the created copy. Deletes the layout currently selected. Information about the Templates area in this dialog can be found here. In the Users module, you can define for each user account which layout should be loaded when that user logs in in the browser.